They say everyone puts their pants on one leg at a time, but you can do one better and put your pants on two legs at a time. How, you may ask, can you put your pants on two legs at a time? Why with the the Pants-2-Legs of course. 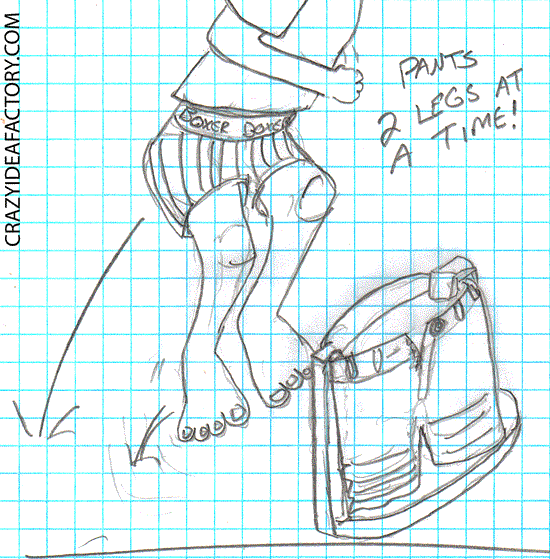 You just load your pants into the Pants-2-Legs make a big hop and pull your pants up both legs at once. It will feel like you have achieved a whole new level of super hero status. Do you ever wish you could come up with a wise and witty response to peoples questions? 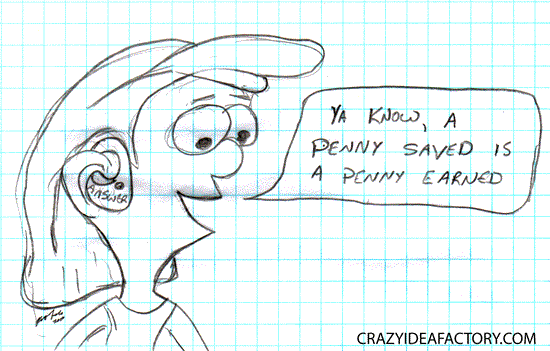 Now you can with the Proverbial Answer Earpiece. It looks like an annoying Bluetooth earpiece, but it really is a handy device that will whisper intelligent sounding statements into your ear. Next time you are wearing the Proverbial Answer Earpiece and someone asks you the time you will be ready to answer with “Sir, a watched pot never boils” or “Like sand through the hourglass, so are the days of our lives”. 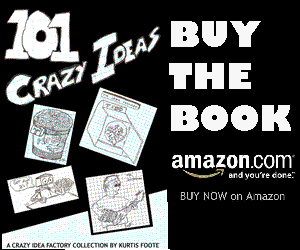 This crazy idea is inspired by the Illustration Friday phrase of the week, proverb. Sometimes I wear shorts without pockets and I don’t have a place to put my keys, cash or ID. 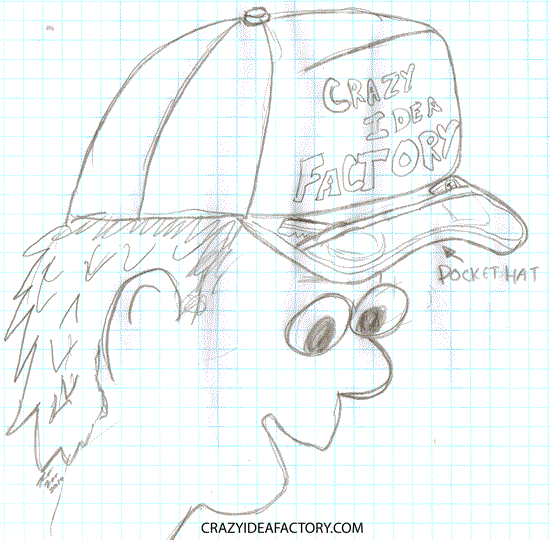 A pocket built into the brim of my hat would give me a place to store those necessary items. 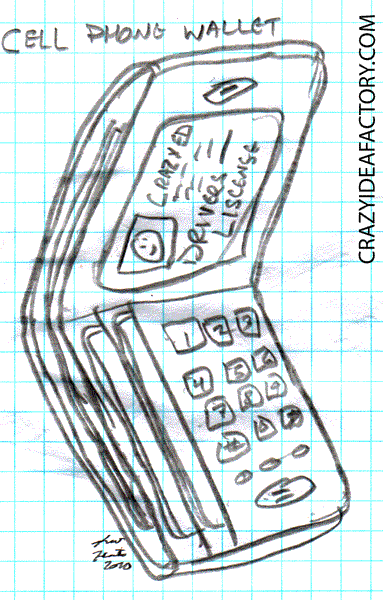 It used to be common for every guy to have a handkerchief in his pocket. Handkerchiefs have gone out of sync with popular culture, replaced by disposable tissues. The problem is the need for the handkerchief has not gone away. Noses still run, but now when they do if a guy is not near a box of tissue he has nothing to stop the dripping snot. He is left with three choices; let his nose run, wipe it on his sleeve or sniffle it back until a tissue can be found. The answer to this problem is the pocket tissue dispenser. 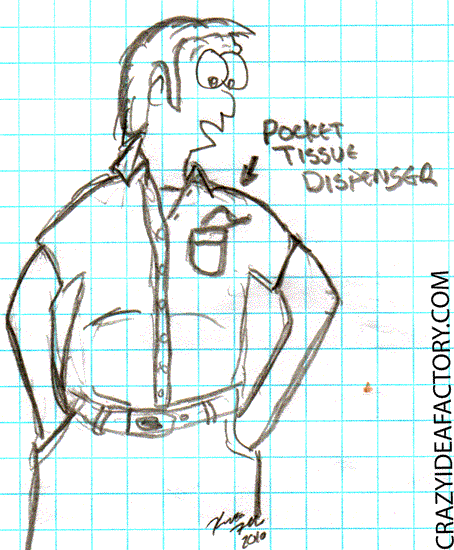 A pack of facial tissues designed to fit in a breast pocket. It is really too bad there is such a stigma about public flatulence. It can be painful to hold back the natural gas release your body requires to function. 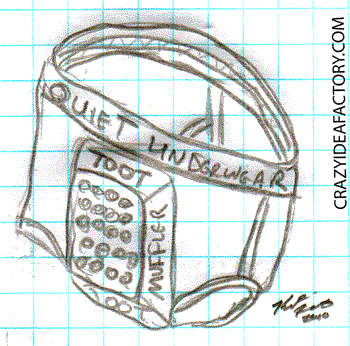 Muffled underwear is the answer to to your need to pass gas anytime you want. Just letter rip, the attached toot muffler will quiet that level 4 fart explosion the same way a Flowmaster Muffler quiets a big diesel engine. And don’t worry about the smell, it is taken care of by the included triple layer carbon stink filter. And for the ultra stinky ones, we have added a fresh as the Carolina Pine Tree air freshener. I am sure you have heard the old saying “What’s good enough for the elephant is good enough for me.” Well taking that idea to heart, I want a trunk. 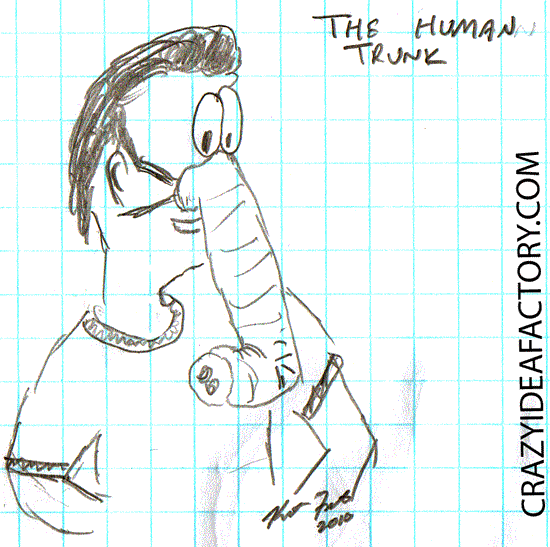 I don’t want just a rubbery Halloween costume trunk; I want a functioning, moving, third arm style trunk. At this moment I am imagining sitting at my computer using my trunk to eat peanuts or popcorn while both of my hands are busy typing on my keyboard. 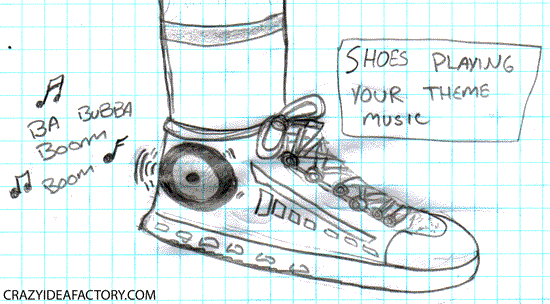 I think maybe with an Arduino and some servo motors I might be able to make this happen. Fashions from the revolutionary era have not made a comeback for quite some time. It is time to change that, this year to celebrate Independence Day dress like a founding father. Pick your favorite; Thomas Jefferson, George Washington, Benjamin Franklin……. 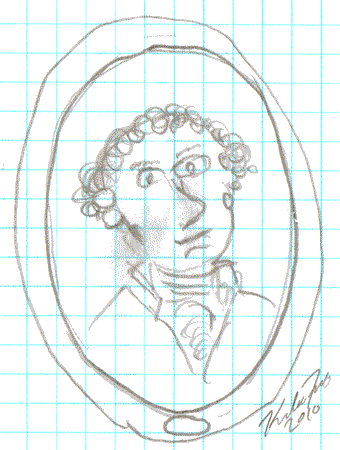 Don the powdered wig, put on the ruffled shirt, breeches and plop a tricorn hat on your head. Happy Forth of July!!! Ever search for a coat hanger or a decent coat hook and not be able to find one? 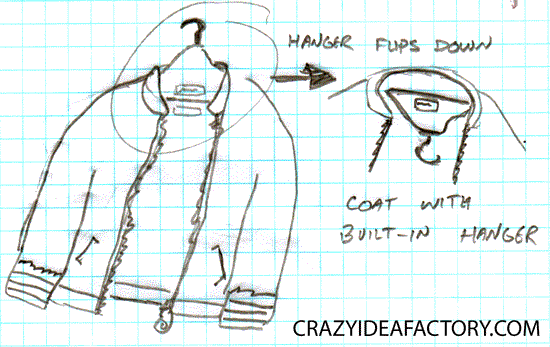 That is why coats should have built in hangers. The hangers will of course need to be soft and comfortable while you wear the coat, otherwise they would hurt.